In a bowl, mix sugar and milk with an electric mixer. Cook over low heat for 5 minutes. Turn the heat off once the mixture begins to thicken and stir in cream, half-and-half and vanilla. Prepare candied pecans by melting sugar in a saucepan and tossing pecans in it. 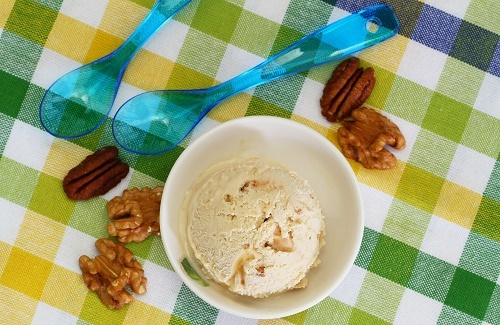 Once the candied pecans harden, add to the ice cream mixture and use in an ice cream maker.